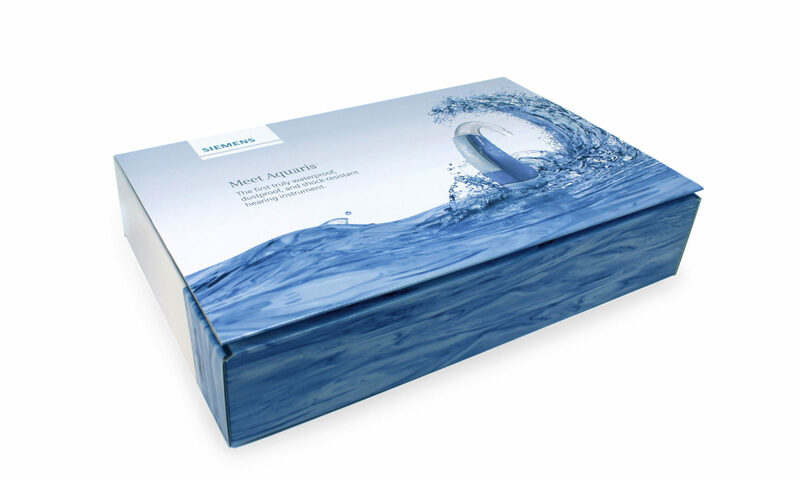 In 2011, Siemens Hearing Instruments reached out to Crowley Webb to help launch the world’s first waterproof digital hearing aid. Since the incidence of hearing loss is trending younger, Siemens created the line specifically geared for an active lifestyle. These innovative instruments, featuring Bluetooth® technology to pair with mobile devices, were touted not only as waterproof, but sweatproof, dustproof, and shockproof. The Aquaris™ line truly allows individuals suffering from hearing impairment to be in their element – no matter what that may be. We started by creating lifestyle-appropriate collateral materials for the hearing care professionals to assist the sales reps with sell-in. Once there was interest at the professional level, and to coincide with the holiday season, we created gift packs to incent best customers. The gift packs contained two sample hearing aids and a number of accessories. In keeping with the active positioning, an iPod shuffle, gym bag, and sports bottle were also included. 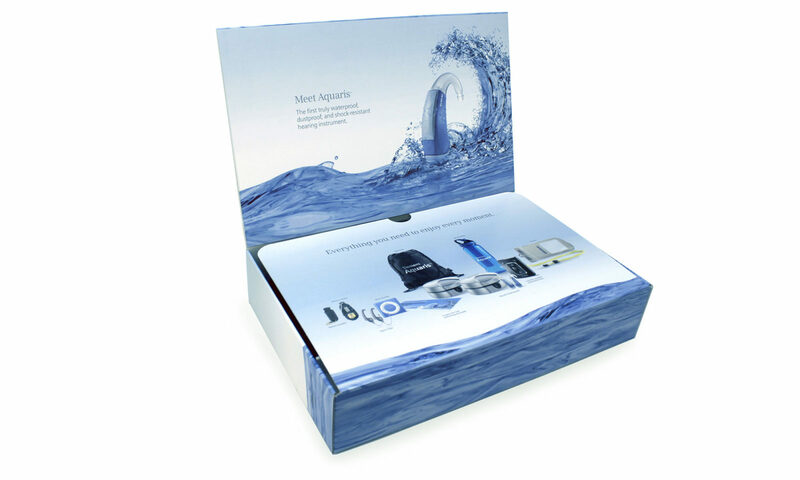 But we were just getting started – the campaign included a series of innovative point-of-purchase materials, brochures, and a co-op advertising program featuring direct, print, broadcast, and digital elements. Co-op print ads were created to drive traffic to doctors’ offices. We designed packaging to be as beautiful as the devices themselves. 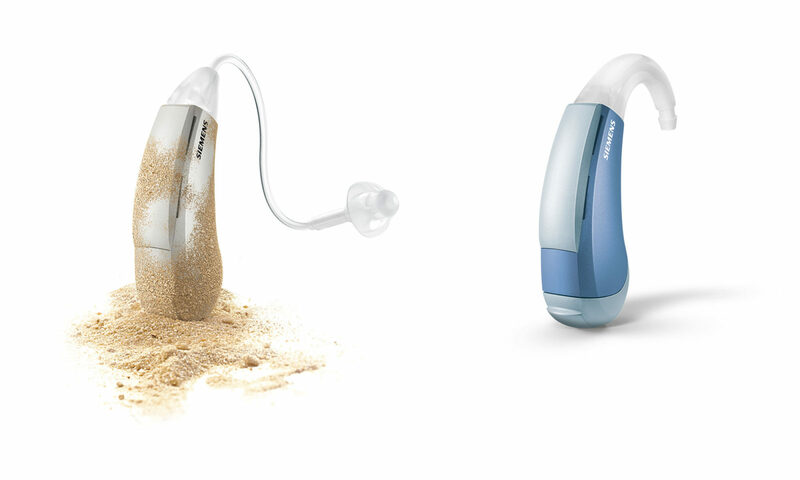 Selling 400 units per month, the Aquaris line continues to be a worldwide leader in the active lifestyle segment, and a staple of the Siemens Hearing Instrument portfolio. Aquaris has also received many industry accolades – and was even named an International Consumer Electronics Show (CES) Innovations 2013 Design and Engineering Honoree.